As The King is the top man in the hierarchy, let’s take a look at His Majesty’s collection of robes. 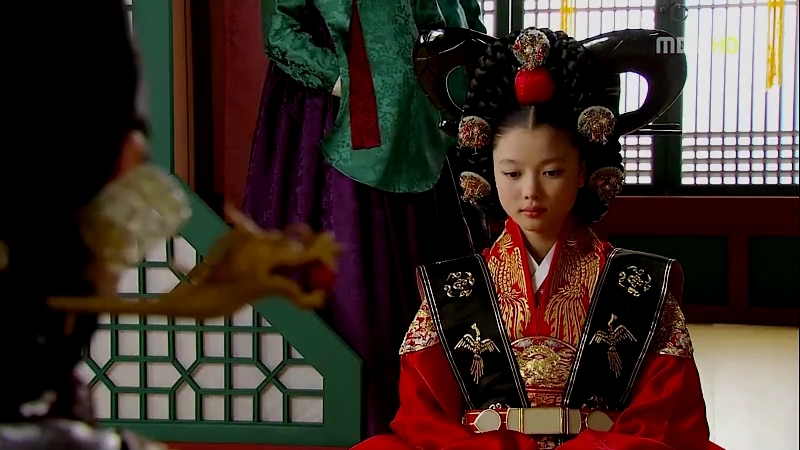 The most common one, seen in dramas is the red colored robe with large, round embroidered emblems of dragon sewn on it. It is called gonryongpo (곤룡포), an everyday cloth for the king and the crown prince. So that explains why the king is always wearing the red robe all the time he appears in front of people. 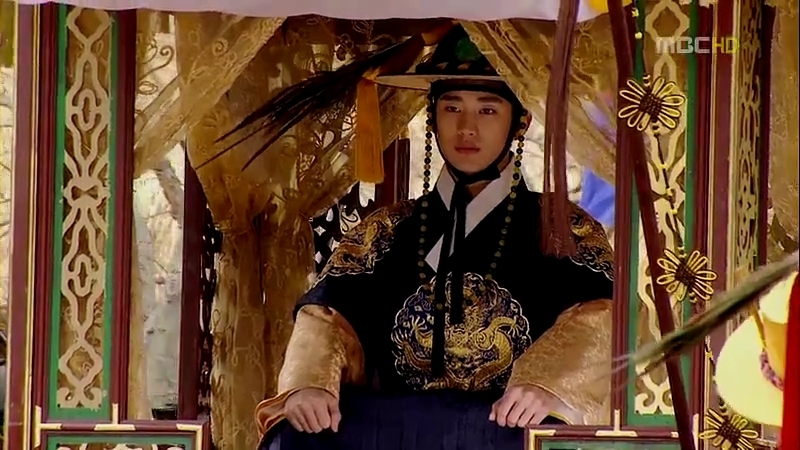 Gonryongpo is worn by the reigning king, the crown prince, and the first son of the crown prince (future crown prince). The difference lies in the color and the dragon emblems. Red/scarlet gonryongpo is reserved for the king, while the blue is for both the crown prince and his first son. For the emblem, the king wears a five-toed dragon emblems known as ohjoryongbo (오조룡보), while the crown prince wears sajoryongbo (사조룡보), a four-toed dragon emblems. For the first son of the crown prince, he wears samjoryongbo (삼조룡보), the three-toed dragon emblems. I never squinted really close enough to see whether they being precise with the emblems in the dramas or not, but most of the time it’s a five-toed dragon emblems since there are more kings depicted in the dramas than crown princes. 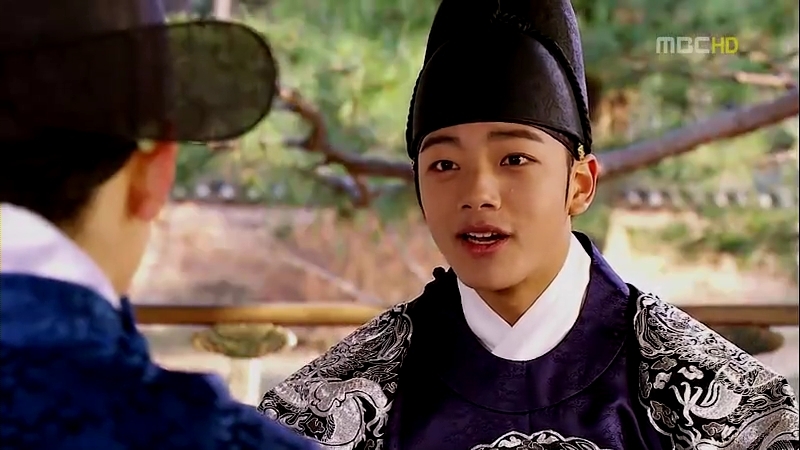 Lee Hwon as a Crown Prince, wearing a blue gonryongpo and sajoeryongbo on the front, back, and shoulders. The dragon’s toes are visible on his left shoulder: four for him as a crown prince. 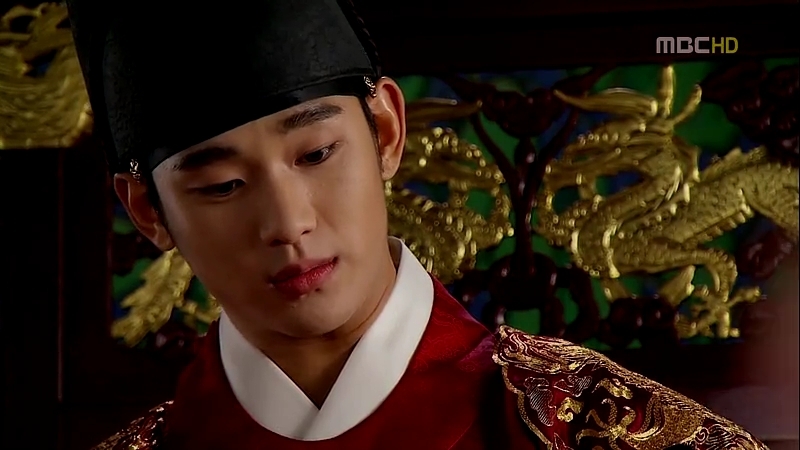 As a king, Lee Hwon is now donning a red gonryongpo with ojoeryongbo. The dragon now has five toes, visible on his left shoulder. Along with the gonryongpo, a crown known as ikseonggwan (익성관) is worn. It is mainly depicted as being black in color is dramas but there were many variations and colors back in Joseon Dynasty. The waist belt with jade, gakdae, is another crucial accessory for the robe. 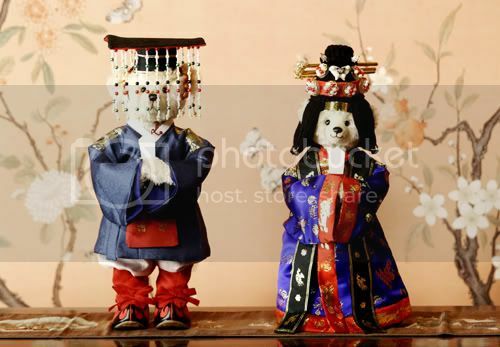 For any special ceremonies and rites such as coronation and wedding, the king wears a special robe, myeonbok (면복). There are actually two kinds of myeonbok: gujangbok (구장복) or ‘nine symbol dress’ for the king and sibijangbok (십이장복) or ‘twelve symbol dress’ for the emperor. It is called gujangbok because of the nine kinds of symbols embroidered on the robe. For the upper part of the robe, dragons on the shoulders, mountains on the back, fire, pheasants, and tiger-designed wine barrels on the sleeve hems; called ojang, meant for yang. For the skirt, millet, rice grains, axes, and fire; called sajang, meant for ying. From the far left, clockwise direction: dragons on Hwon’s shoulders; five peaks on the back; fire, dragon, and peaks on the skirt (probably for crown prince); fire on the hem of the sleeve. The robe is reddish black in color for the outer side and purple for the inner side. It is shorter in length compared to normal robe so that it won’t hide the embroidered patterns on the skirt. The inner garment (most of the time not visible), known as jungdan, is white in color and lined with blue fabrics on the hems. Daedae is the red and white waistband used to tie the skirt. The waist belt, hyeokdae is lined with jade. There are a pair of jade plates called pae, hung from hyeokdae. The skirt is rosy pink (or nearly red) in color. A knee pad, pyeseul, was once tied to the waist behind the skirt, but nowadays it’s usually sewn to the skirt. It is rectangular in shape, made with red silk with black fabrics lining the hem. The things visible in this scene: the robe, the square hyeokdae, and the upper part of the skirt. Husu is the tasseled rear part of the skirt. Hwon is wearing the husu at the back, but husu worn by Minister Yoon is more visible in the right picture. Mal, a pair of ceremonial red socks are worn together with red shoes called seok. And for the mortarboard-like headgear, it is a crown called myeonrugwan. A number of strings with beads are hanging from the front and the back of it. The number varies for each of its wearer as to show his status: twelve for emperor, nine for king, and eight for crown prince. The king also has the military clothing used when he’s going for an outing or a military missions, i.e. paying respects to the Dynasties in China. Moving on with the robes for Her Highness The Queen and also The Princess. The top women of the country are just like the ordinary women: they are given chance to wear different colors for their court attires but there are some restrictions and color coordination reserved for each of their own ranks. Nevertheless, the queens and the princesses are luckier than the kings and the crown princes as they get to don colorful clothes, rather than sticking to single color only. The most common and everyday attire worn by the female members of the royal family is dangui (당의). It is actually part of the ceremonial dress or jacket, but the queens and princesses adapted it for daily wear. It is characterized by a shaped front and back lower parts, like part of a circle with pointed ends.The striking difference between the dangui for the royalties and the other court attendees such as court ladies and noblewomen is that those of royal family members have geumbak, or golden leaf patterns on them. Plus, for the empress and the queen, they have the dragon emblems sewn on the shoulders, the front, and the back of the dangui. It is the same as what the king wears, ohjoeryongbo. Dangui is worn with a seuran chima, a type of skirt with geumbak on it. Yeon-Woo wearing a pink dangui and a scarlet seuran chima. Princess Min Hwa’s dangui is less elaborate, probably because she’s still a girl, but for a more matured princess like Princess Kyung Hye, her dangui (which is worn by Se Ryung here) has more geumbak on it. Notice how they replace the dragon emblem with circular flower patterns for the princesses. For the important ornaments, it depends on the hairstyles used by the respective people. Queens usually sport the halo-like hairstyle as what Queen Soheon has above. 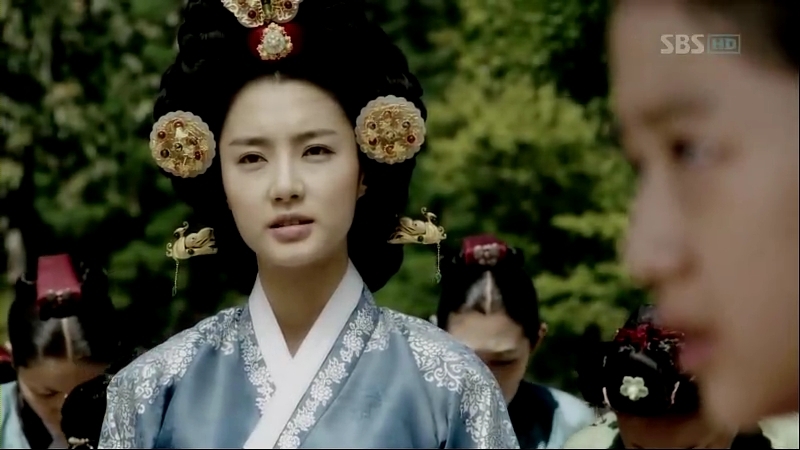 It is known as eoyeo meori (어여머리), also called as ‘the royal hairstyle’ because only women of the court can use this one. Tteoljam (떨잠), the two round-shaped ornaments with fluttering metal flowers and butterflies are used for this kind of hairstyle alongside other large and small hairpins. The next one: the most common style used by queens and the married princesses is jjeokjin meori (쪽진 머리), in which the hair is brought to the back and tied into a bun. A long hairpin is used to fasten the bun and also decorate the hair while showing the rank of the wearer. The generic term is binyeo (비녀), but the specific name differs according to the shape. The dragon-shaped hairpin, yongjam, is reserved for queen. The red pearl in the dragon’s mouth gives the meaning that each of one’s wish will come true. 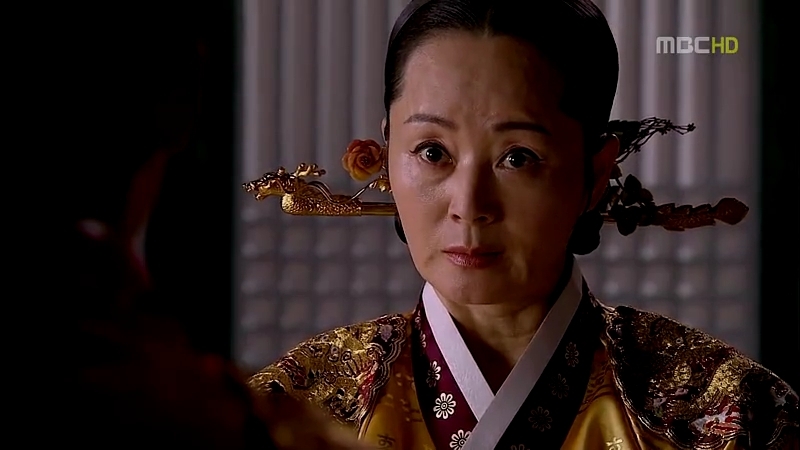 Queen Dowager Yoon’s changing yongjam. The phoenix-shaped hairpin, bongjam, is used by the concubines and the princesses. Different shapes of bongjam for each of them; from the top left, clockwise direction: Lady Park, Queen Yoon, Yeon-Woo, and Princess Min Hwa. The young princesses will use the normal hairstyle, in which the hair is tied at the back in single braid. It is known as daenggi meori (댕기 머리). As the name suggests, this hairstyle has daenggi, a ribbon tied on the braid. Another ornament called baetssi daenggi is also worn on top of the head. Additional small but elaborate hairpins called cheopji are put on both sides of the hair. During special ceremonies, there are several options for the queens and princesses to choose for their ceremonial robes. Wonsam is the ceremonial robe that can be worn by the empress, the queen,and the princess. 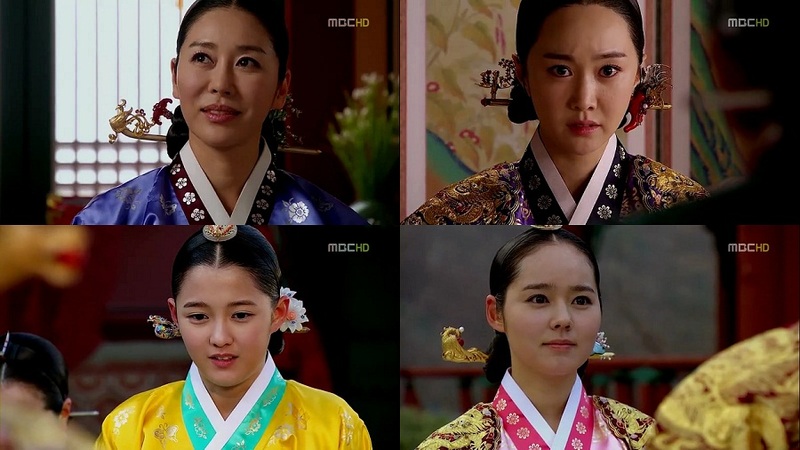 However, there are specific colors and patterns for the respective ranks: yellow color with dragon pattern (hwangwonsam) for the empress, red color with phoenix pattern (hongwonsam) for the queen, purplish red color with phoenix for the concubine, and green color with flower pattern (nokwonsam) for the princess. A crimson waistband, daedae, is worn with wonsam like this. Hwarot is the lavish crimson robe with embroidered patterns on it. It is usually worn by princesses when they are going to get married. Underneath the robe, a yellow samhuijan jeogori (jacket) with crimson/blue daran chima (skirt with gold patterns) are worn by the princess. Princess Kyung Hye with samhuijan jeogori and Se Ryung with daran chima on. Various patterns like peonies and lotuses along with waives, rocks, phoenixes and butterflies which symbolize long life and good luck are embroidered on the hwarot. Letters symbolizing good luck and marriage lives are also embroidered,for instance ‘二姓之合’ (two last name are united) and ‘萬福之源’ (the foundation of every luck). For the headgear and ornaments on the hair, a longer yongjam is put through the sushik (a hairstyle for the wedding itself) in order for the ap daenggi, a pair of ribbons to be hung from it to the front. A coronet known as hwagwan is worn on the head and doturak daenggi, a big ribbon is hung from it to the back. From the day of Princess Kyung Hye’s wedding; from the top left, clockwise direction: the various patterns on the hwarot and daenggi, the embroidered letters in the front, the doturak daenggi, the hwagwan and the ap daenggi hanging from the long yongjam. Chijeokui is a variety of jeokui. It’s a red ceremonial robe with circles down the hem of both sleeves and at the lower part of the back flap. Yeon-Woo is wearing jeokui and holding the paeok. There are two types of hairstyles used for jeokui. The first one is keun meori (큰머리). It is almost the same as eoyeo meori, but has an additional headgear called tteoguji. The second one is wearing daesu, a very large and heavy headgear or crown. Daesu is the headgear reserved for the queen or crown princess. Yeon-Woo wearing chijeokui with keun meori. Bo-Kyung wearing chijeokui with daesu. The ordinary princes have different robe compared to a crown prince. Their court robe is almost the same as what the government officers wear; the difference lies on the colors and the patterns on the rank badge, or hyungbae. The round-collared robe is called dalryeongpo. For the princes like Prince Gwangpyung, the color for the robe is purple. 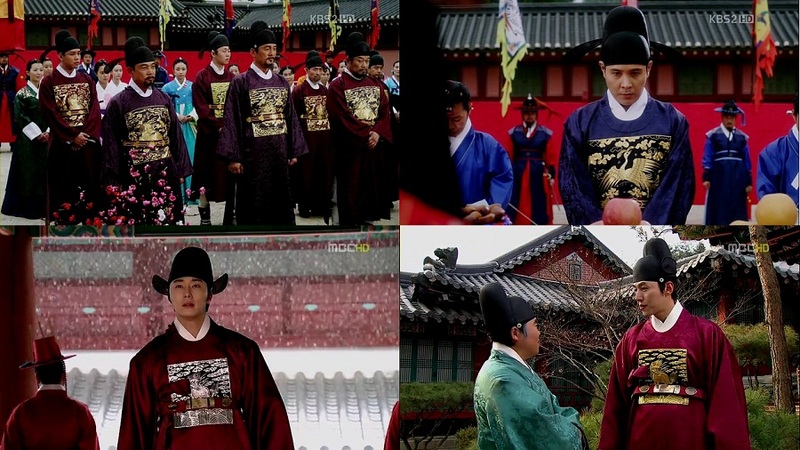 In the picture above, it is shown that only Grand Prince Suyang and Grand Prince Anpyung who wears the purple dalryeongpo while Prince Yangmyung wears a dark red dalryeongpo. The purple robe is probably for the princes whose mother is the queen and the dark red is for the princes whose mother is the concubine. For the prince consorts, there isn’t any rigid color set for them (as what I’ve found until now) . 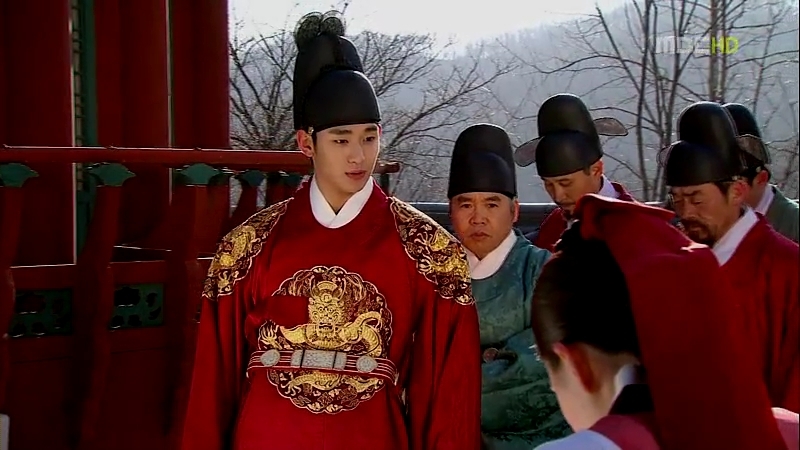 Royal Consort Jong wears a blue robe, while Heo Yeom is wearing a purplish red robe. The daily wear for the officials are also known as dalryeongpo. The colors are based on the ranks of the officials: red for 1st senior to 3rd senior rank, blue for 3rd junior to 6th junior rank,and green for 7th junior to 9th junior rank. During the early Joseon Dynasty, the robe color was the only reflection to one’s rank inside the government, but soon they begun to adapt the mandarin square from the dynasties in China. The rank badge, or hyungbae is made up of embroidered cloud patterns and animals: cranes for the civil officers and hopyo, a tiger-leopard mythical animal for military officers. Hyungbae with two animals are for 1st to 3rd rank and those with single animal are for the 4th to 9th rank. One look and you could tell who is more powerful than the others: Minister Yoon donning a red robe with two cranes on his rank badge while the three Physiognomy Ministers are all in blue robes with single crane on their rank badges. All of them are civil officers. For the special ceremonies like announcement of royal decrees by the king, the officials will dress in a special red robe called jobok. A yanggwan, which is a crown with two tassels hanging from the long hairpin. In the picture above, all the ministers are holding scepters made of ivory. 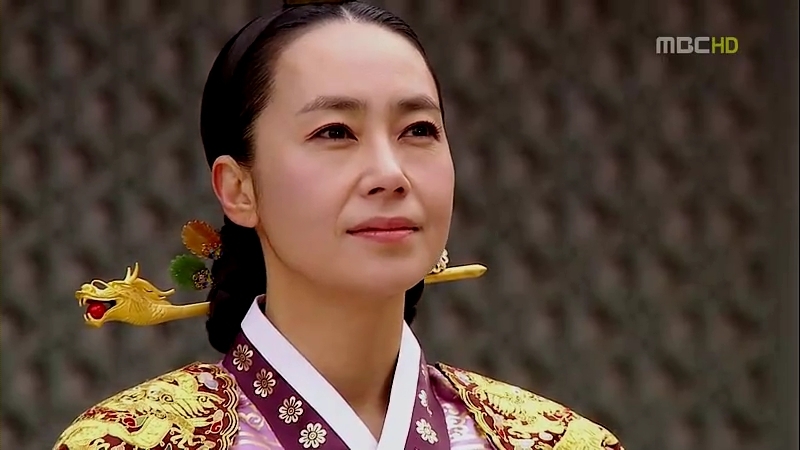 Lady-in-waiting,or gungnyeo also have their own robes. They usually wear dangui, a ceremonial jacket just like the queens or princesses, but with no geumbak or gold patterns. The colors and hairstyles differ according to their ranks. The highest among them, which is sanggung or court lady, wears a dark shade of jade dangui with binyeo and cheopji, a small hairpin worn on the hair in the shape of frog. They usually tuck their hair behind in a bun. Nain will wear a lighter shade of jade dangui with their hairstyle being the same as the sanggung. Trainee nain wears a pink dangui, but most of the time they will wear a pink jeogori. Their hairdo is a bit different: they will use saeng meori, in which the braid is brought onto the head and daenggi is used to decorate the hair. Court Lady Jo wearing a silver cheopji on her head and a binyeo. A trainee nain sporting saeng meori hairdo. A color variation is used for Sejong’s special nain:they wear a dark jade jeogori here. Wow – that was so informative. Thanks so much! I’ve always wondered about some of the clothes & elaborate headgear. Wow..thank you so much. It’s really help me about the beautiful korean court attire,especially Joseon. thanks a lot for the info..really really love reading it as i’m into sageuk drama mode nowadays!!! You’ve done so much research to write this informative post filled with beautiful photos to illustrate each article. Thank you from the bottom of my sageuk-loving heart! Wow! Thanks for this very informative post! That’s one reason why I like watching sageuk dramas (even though they’re freaking long haha): the costumes!! (Or rather, the royal wardrobe). More please! Haha. But of course you could take your time. ooohhh.. I would love that one. I really liked the uniforms of the SKK scholars in SKKS. Oh that’s fine! Haha. Put in as much as you want. I am so looking forward for that post. No pressure though. Haha. wow, thank you for taking time to post something like this, very informative! Excellent post since I luv sageuks. Thanks 4 feeding my addiction a little education. hehe I write recaps on Moon That Embraces The Sun! This post is amazingggg; I’m always very interested in the clothes that the characters wear in saguek dramas but I was never able to put names to each set of clothes that I recognised through my years of watching kdramas. Wow! I’ve found this info very helpful! Thank you! This is imformative! Thank you! By the way, have you found any more sources for the military attire? I’m really curious of the hat of the first picture you posted? The one with beads and a peacock feater with read strings on it? Please do tell me if you know! thanks! – the hat is called jeonrip and it is decorated according to the wearer’s rank. the high rank officers will wear it with the beads, red tassel, knotted ribbons and peacock feather on it. – the clothes is commonly known as gugunbok. it consists of the narrow sleeved dongdari (top) and jeonbok, the long vest. a belt is worn on top of the vest. Does anyone know the name of the kind of clothing the crown prince or the king would wear when they go for sport?